When I say “saved 4th of July”, I really mean, “saved me from disappointing my children.” Which, as any parent would readily understand, means exactly the same thing. We live in a new development in San Ramon (Windemere), and we didn’t move in until late July last year. Since my daughter needs to be in bed by 7 or so, having the whole family out to see the fireworks around 9:30 wasn’t really an option. I knew San Ramon had a pretty big fireworks show, but I had no idea whether we’d be able to see the fireworks from our house. As the bird flies, they’d be just 4 miles away or so… but between us and the launch site were at least two ridges. It occurred to me that Google Earth might be able to solve this dilemma. 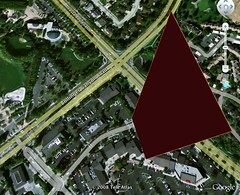 I got the location of the fireworks (Bollinger and Alcosta), and navigated there in Google Earth. Just one problem: how tall do fireworks detonate? I tried a couple Google searches, but the obvious attempts resulted in lots of fireworks regulations for home use, ads for fireworks, etc… not what I was looking for. So I asked my Twitter followers. Within a few minutes, I had replies from Sean, Julio and John. (John’s clearly a better Google searcher than I am. Please don’t tell anyone at work.) I love Twitter. Sure enough, it looked like I’d be able to see the fireworks! (For those wondering: the satellite images of our new development are a couple years old.) Sure, they were a couple miles away, and maybe one out of four blasts happened behind the ridgeline… but the bottom line was that the boys got to see their fireworks, and Becca got to sleep (saving us all from 5th of July “fireworks” during the day). The McCain administration would reserve all savings from victory in the Iraq and Afghanistan operations in the fight against Islamic extremists for reducing the deficit. Since all their costs were financed with deficit spending, all their savings must go to deficit reduction. More on this incredible policy announcement here and here. Let me try and figure this out: after the Bush administration maxed out the country’s credit cards, President McCain would win the war (w00t!) quickly, and use the debt we’re not incurring (in McCainonomics, this is called “savings”) to balance the budget. Now, I went to law school because there was no math involved. But is that really how it works? Because, if so, I’d like to make an announcement: effective tomorrow, Wednesday, July 9, I am leaving Google and will be purchasing Yahoo. Not shares of Yahoo, but Yahoo. How could I possibly afford to to buy Yahoo when Microsoft couldn’t? Glad you asked: the savings from not buying Google will more than cover my purchase price. See how easy this is? McCain’s a genius.